On February 8th, the Chinese people, and the larger Asian community in general, celebrate the Lunar New Year. To commemorate this holiday, the Chinese eat certain dishes and foods that are full of symbolism. This is in hopes that by doing so, it will bring good fortune, love, and health, onto themselves and their families. In the case of businesses, incorporating these symbols will bring wealth and success. At all of my traditional dinners, a whole fish will be served because the Chinese word for fish sounds like the word for "abundance." A dish that is more commonly found at New Year's celebrations is "nian gao," a sticky rice cake. The word for this dish sounds like the word for "increasing prosperity year upon year." And much like the New Year's festivities, Chinese architecture can be full of symbolism as well. Take, for example, the Taipei 101 tower. Designed by a Chinese architect trained in America, and residing in Taiwan, the Taipei 101 was the world's tallest building upon its completion. The architectural firm C.Y. Lee and Partners incorporated many traditional Chinese symbols and design principles into the building. 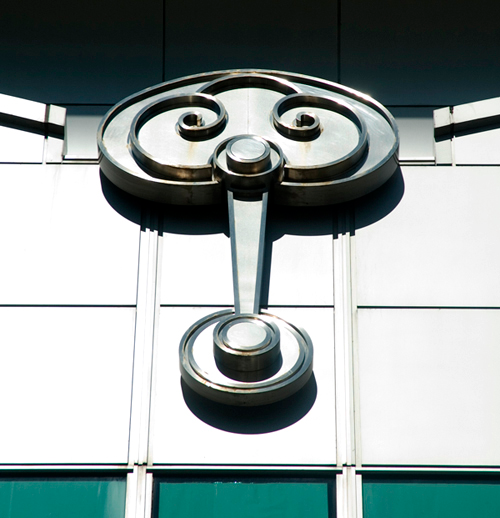 Placed along the facade are "ruyi," a curling, stylized cloud-like motif. This can also be found on traditional artwork, as depicted on this Chinese vase. The logo itself is a circle with a filleted rectangle in the center, repeated three times. This is meant to evoke ancient coins. In Chinese culture, circles represent "unity, completion, wholeness." This symbol can found within the retail floor plans for Taipei 101, as well as the large park at the base of the building. This coin is also located on the four facades of the building. Finally, the main portion of the pagoda form is comprised of 8 clusters of 8 floors. This use of the number 8 is intentional, because the Chinese word for "8" sounds like the word for "fortune and prosperity." Also the "8" is written with two circles - how fortuitous! So either by designing buildings in modules of 8, with ancient motifs, or eating whole fish at dinner, you can imbue yourself, your family, and your business with good fortune and prosperity in the upcoming year!